Two examples from Nauru reveal the lack of law and order and child services and protection on Nauru. One 44-year-old Iranian refugee father has been in jail since January 27. He is a sole parent on Nauru. His eight-year-old daughter has been cared for by another refugee family since was he was abruptly taken into custody. Neither the Nauruan authorities nor the Australian service provider, Connect, have lifted a finger to even enquire about the welfare of his daughter. The Nauruan police were actually called by Connect after the man had moved himself and his daughter into spare accommodation in Nibok on the west of the island. Connect objected to the move. For almost two weeks, the Iranian man has been held in jail. He appeared in court yesterday (Monday February 8), although the exact charge was unclear. But he was returned to jail. The second incident involves a 26-year-old single female Iranian asylum seeker who was arrested after an argument with guards at the mess in the single women’s section of the family camp, RPC 3. Around 7:00 pm on February 8, the Iranian woman tried to take some food out of the mess to her room. The mess closes at 8:00 pm – and doesn’t open until the morning – so asylum seekers are left without food for a long time. Wilson security guards confronted her at the mess; there was an altercation and the food was taken from her. Around 10 pm, Wilson security guards arrived at the single women’s compound with Nauruan police to arrest the woman. She was released a few hours later but has been told she will be re-arrested over the incident. She has been left with abrasions and bruises as a result of the incident. 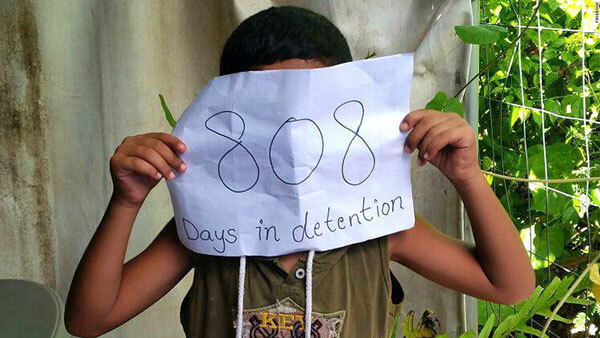 “This is more evidence of the lack of the rule of law on Nauru. The police are simply an extension of Wilson’s and the detention regime on the island,” said Ian Rintoul, spokesperson for the Refugee Action Coalition. “Even worse perhaps, the lack of concern for the eight-year-old reveals the complete failure of both the Nauruan and Australian authorities, and the lack of child welfare services on Nauru. Meanwhile refugees continue to be discriminated against such as the supermarket “near Anibare” that had refused to serve refugees. The particular supermarket is at the Civic Centre near the airport, believed to be Eigigu supermarket. “The difficulties in specific identification of the supermarket is a direct result of the communication difficulties with Nauru in general. The Nauruan government maintains a media blackout precisely to prevent information about the conditions on Nauru being reported more widely. But we are told that the particular supermarket has a bad reputation for only serving Nauruans or Chinese shop-keepers, particularly if there are shortages, and shortages are routine,” said Ian Rintoul. The Australian Lawyers Alliance (ALA) has said that any decision to send the children of asylum seekers to offshore detention from the Australian mainland would constitute a breach of the Immigration Minister’s duty of care as well as the Commonwealth’s own Workplace Health and Safety laws. The full bench of the High Court recently ruled that the federal government has the power under the Constitution to detain people in other countries, finding that the conduct was within the law. ALA spokesperson and barrister Greg Barns said that High Court decision has yet again demonstrated that the rights of vulnerable people in Australia are not protected by current laws. “If the Australian government returns the children to Manus Island it is doing so knowing full well that the Commonwealth is liable for any harm which happens to those children,” Barns said. Barns said the Workplace Health and Safety Act makes it an offence to allow persons to be present in unsafe workplaces, irrespective of whether those persons are visitors, residents or workers. “The reality is that offshore detention is a gross breach of Australian international human rights obligations and is also a breach of the international refugee laws and standards. The decision of the High Court does not in any way shape or form change that. Last week, in a paper published in Australasian Psychiatry, Dr Michael Dudley, a psychiatrist at Sydney Children’s Hospital, wrote that prolonged detention showed “reckless indifference and calculated cruelty”. Such policies misused health and welfare professionals to “underwrite state abuses and promote public numbing. Next article – Hands off Medicare!